★ Creating and growing an active and passionate local railroad historical society interested in developing a railroad-themed historical district with vintage locomotives, passenger cars and freight cars, as well as related facilities for maintenance and administration. ★ A downtown museum and visitor center with exhibits tracing the history of railroading in Tracy and the Central Valley. ★ A scale model railroad display mirroring rail activity in the area, along with railroad-related activities for kids of all ages, will also be a component of the visitor center. ★ Weekend rail excursions from downtown Tracy on the former Southern Pacific right-of-way to Midway (via the Altamont branch) or the “Brewery” and “Holly Sugar” spurs in town — and perhaps along the Mococo line (to Brentwood), the Westside branch (via the California Northern to Los Banos) or the Banta-Lathrop line (via the Union Pacific) — using borrowed or leased power (perhaps from the California Northern, the California State Railroad Museum or other tourist railroads). Click here for a map of potential excursion routes. ★ An annual downtown Tracy Trainfest, attracting train enthusiasts from throughout the western United States, with vintage railroad equipment on display. ★ An annual railroad movie festival at the Grand Theatre Center For The Arts, along with a railroad-themed art and photography competition. ★ The potential of attracting railroad-themed businesses to the downtown area, including hobby shops, restaurants, antique stores, and other related enterprises. In addition, the boost in traffic through the Railroad Historical District, particularly on weekends, will increase the number of potential customers for existing restaurants, cafes, stores and shops. 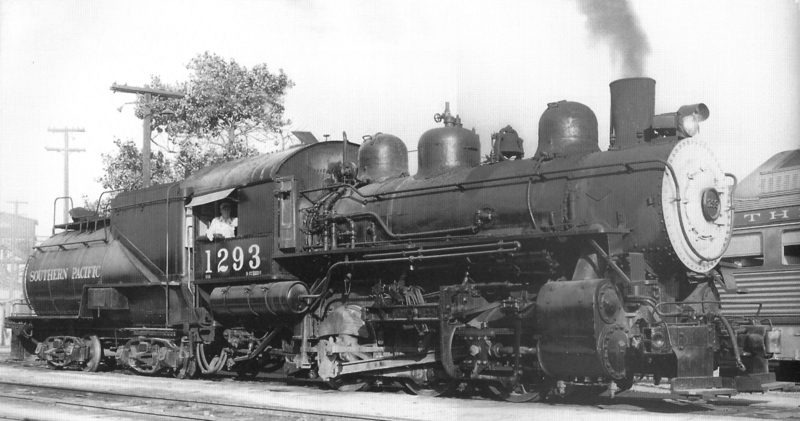 Southern Pacific switch engine #1293 at Sacramento in August 1956, the year before its retirement in Tracy. ★ The restoration of “Tracy’s Locomotive,” the venerable #1293 Southern Pacific S-14 Class 0-6-0 switch engine now on display at Dr. Powers Park near Tracy Boulevard, for use as the signature motive power of the tourist railroad or the focal point of a museum display. ★ Organizing and launching a San Joaquin Valley Model Engineers club to design, construct and operate a model railroad layout based upon the Southern Pacific’s Tracy facility in the mid-1950s. 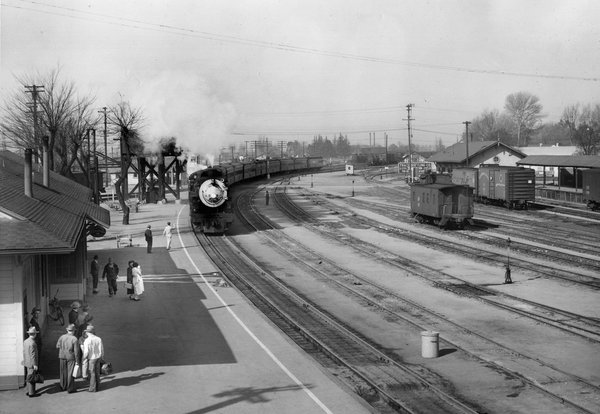 The layout would serve as a starting point for other Railtown Tracy projects, and would be an important local historical resource. ★ Rebuilding the historic Altamont line through Ellis, Midway, Cayley and into the old town of Altamont, if possible. (The line, which basically parallels Schulte Road, currently ends alongside Patterson Pass Road at the Alameda-San Joaquin County line, about eight miles from downtown Tracy.) This line follows the original path of the transcontinental railroad from points east into the Bay Area, and dates back to the 1860s. ★ The development of youth programs to allow local students learn more about the history of Tracy and the San Joaquin Valley, and how railroads spurred growth here and throughout the west. Also, merit badge programs in railroading and model railroading may be offered for Boy Scouts.